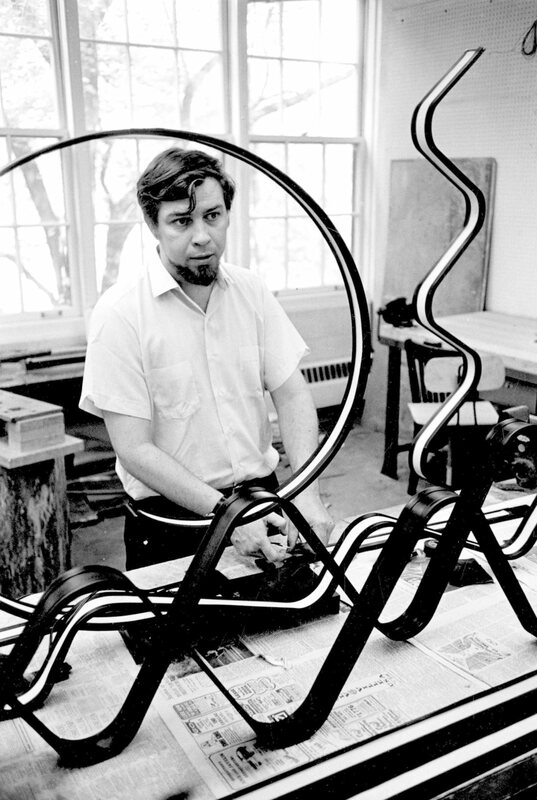 Jack Burnham working on one of his viewer-activated luminous ribbon pieces, 1982. Photo: Northwestern University archives. To dismiss art in front of a group of curators and art historians deeply committed to its care was a provocative move and entirely in character. It was meant as more than a simple provocation, however; Burnham was announcing a need to change how we judge and value art, in response to art’s own recent “dematerialization” and to artists who were revising an older, static theory of environment by acknowledging the responsive character of environmental systems. Aesthetics, he argued, had to respond in kind to these new developments by anchoring itself to new criteria. Art could no longer be judged according to its capacity to provide visual pleasure, nor was it merely a matter of having been chosen by an artist or bounded by the framework of a gallery. What if, instead, we considered art as a tool that, like any other tool, extends human capabilities? The work of art, he suggested, was particularly useful for revealing relationships and was only art so long as it continued to perform its revelatory function. Like the machine or the ritual, art was an “information-processing device.” It could not generate or embody thought, but was a temporary functional apparatus suited to drawing connections between cultural and natural phenomena. An old work of art was about as useful in this regard as an old weather report. This notion of the radical disposability of art as an information-processing system undergirded the central conceit of “Systems Esthetics”: the shift away from the production of stable objects toward a critique of cultural practices, particularly an economy driven by rapid cycles of production and consumption, the demand for continual growth, and the voracious appetite for material and energetic resources. Burnham’s synthesis of the concerns of a nascent digital art movement, environmental activism, and the aesthetic strategies of Conceptual art has given systems art its staying power. We owe these concepts to his exceptional ability to combine diverse discourses, including the history of modern sculpture, formalist criticism, liberal economic theory, structural anthropology, theoretical biology, systems design, and religious mysticism. His demand that art be revelatory was grounded in a sort of faith, a faith in the existence of latent meanings and recoverable connections that he passionately pursued. Ironically, this desire to pierce the veil would lead him away from the art world and academia and toward the hermeneutics of his final years. While his intellectual activities moved increasingly outside of mainstream thought, his ominous prediction of “biological self-destruction” for any advanced technological culture that did not address its unsustainable relationship to natural systems feels alarmingly relevant. Burnham’s acute awareness of power relations and allegiance to art-world underdogs were apparent in his swift defense of Hans Haacke after the artist’s 1971 show at the Guggenheim was cancelled and in his championing of noncanonical, esoteric, and frequently unlovable works of art. In 2012, amid the storm that would plunge Manhattan into darkness and flood the storage rooms and offices of its art galleries, Burnham recounted his organicist theory of history. He claimed that, under pressure from overwhelming political and economic forces, political art always cycles away from sincere action toward irony and obscured agendas. He tied art’s political efficacy directly to its ability to draft, revise, and ultimately dispose of itself. Melissa Ragain is associate professor of art history at Montana State University and the editor of Dissolve into Comprehension: Writings and Interviews, 1964–2004, a collection of Jack Burnham’s criticism and conversations that was published by MIT Press in 2015.